Reading has always been a big part of my life since I was teeny tiny. I used to always receive books as gifts and would literally sit and devour one after the other on my beanbag throughout my school holidays. My mum's had this longstanding joke that I'd read anything and everything, so much so that if she gave me a reel of bus tickets I'd probably read them right though to the end of the reel! My enjoyment of books stalled at university. Every time I picked up a book that wasn't Criminology related I felt guilty that I wasn't studying, but it didn't stop me from spending a good hour in Waterstones or the WHSmith book section when in Durham, there's nothing nicer than a good bookshop. In fact, I'd be absolutely over the moon if I was able to get a job in Waterstones one day! Despite owning a Kindle and using it all the time I still adore that feeling of holding a book, a proper one, with that new book smell and engaging pages. 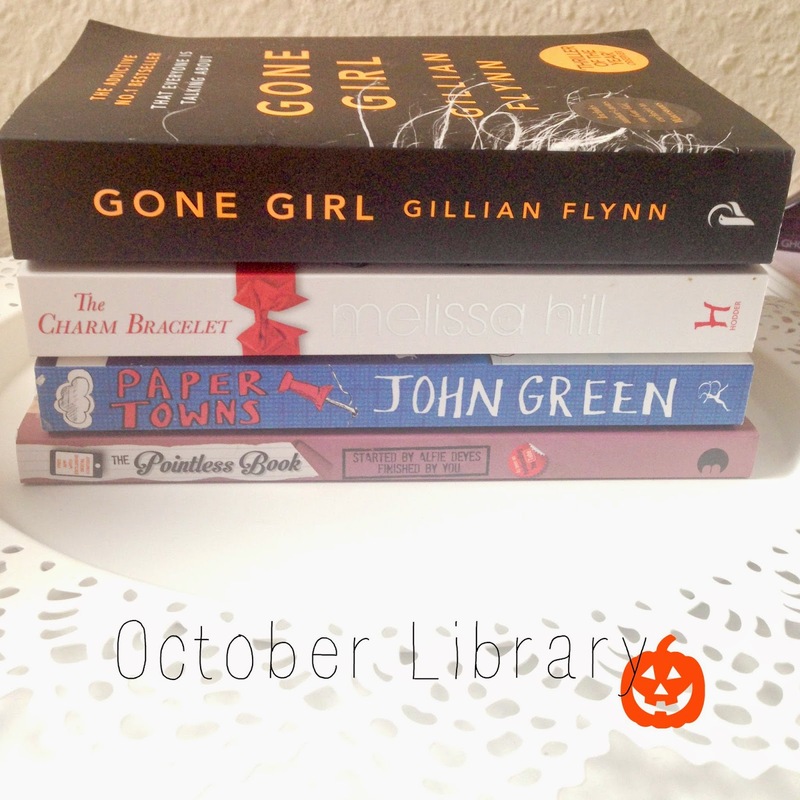 The fact that I am no longer at university, and that I have more than just Kindle books waiting to be read has prompted me to begin a monthly post about my reads for the month, hence, October Library. Gone Girl, Gillian Flynn. Truth be told I'm writing this on October 8th and I've already finished this. I read it in one day, this Monday just gone! The plot is thus: Nick's wife is missing but Nick is claiming not to know anything about it despite all evidence pointing to Nick and her murder. It's such a well written book, with a vibrant plot and leaves a lot to keep you guessing what's going to happen next. I didn't even realise that there was a film version of this in the cinemas at the moment, but I've got tickets to see it tomorrow so hopefully it doesn't leave me deflated by being a rubbish adaptation! The Charm Bracelet, Melissa Hill. I own a few Melissa Hill books because the premises always sound cute and girly and the kind story I'd want to read in the bath with a candle burning. The Charm Bracelet takes place in New York City at Christmas and sees Holly try and reunite a charm bracelet with its owner, with only the charms to help her by acting as clues. I'm excited to start this, but will do so at the end of October to get into the festive spirit. Paper Planes, John Green. Everyone has probably heard of The Fault In Our Stars by now, but what about Green's other novels? I particularly enjoyed Looking For Alaska so I thought I'd try out Paper Planes. The blurb sounds like this: Quentin loves Margo, but it's always been from afar. One night she invites him on an all-night road trip of revenge and he cannot help but go with her. The next day Margo doesn't arrive at school, but she's left clues to her disappearance for Quentin to follow. So what has happened to Margo? I'm intrigued and can't wait to start reading this. The Pointless Book, Alfie Deyes. While I realise I am most definitely not part of the target audience intended to purchase a copy of this book, my final read for this month is Aflie's book and I just know that I'm going to love it! I like that this is an interactive book, you can most definitely get involved with it as each page contains a different activity for the reader (or author!) to do. It would be perfect for travelling to keep you entertained on the move! So that's my October Library, what's on your 'to read' list at the moment? I read gone girl & loved it, I read it in about 2 days! I saw the film too & thought it was pretty good. I'll definitely check out the Melissa Hill book as I love a girly read about Christmas, it sounds perfect! I so badly want to read Gone girl.